like blanket but with the winning features of the well known coating plates. 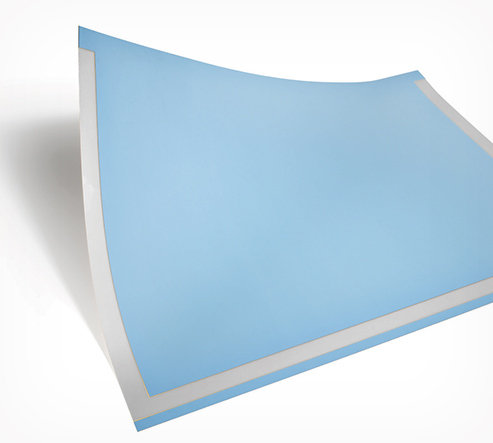 VARNIBLUE 235 HQ is made of 5 layers and the top coating surface is produced through extrusion without solvents released in the environment. The stencil depth of VARNIBLUE 235 HQ of 1.00 mm gives easiness and high quality in cut and peel both spot and flood coating areas. VARNIBLUE 235 HQ has a total thickness of 2.35 mm and can be used as stand alone product on coating cylinders of total undercut 2.35 mm (as Mitsubishi presses). VARNIBLUE 235 HQ features an excellent coating transfer quality with no orange skin and is fully compatible with Water based and UV coatings. VARNIBLUE 235 HQ can be adapted to all different type of presses as far as the clamping requirements.